AP Govt Direct Recruitment Max Age Limit 42 Years - Relaxation of age limit from 34 to 42 years : Direct Recruitment Max Age Limit 42 Years in AP Govt Jobs - Upper age Limit 42 Years. AP PUBLIC SERVICES –Direct Recruitment – Relaxation of upper age limit from 34 to 42 years for the ensuing recruitments through Public Service Commission and other Recruiting Agencies up to 30-09-2019 – Orders – Issued. GENERAL ADMINISTRATION (SER.A) DEPARTMENT G.O.MS.No. 132 Dated: 15-10-2018. Direct Recruitment Max Age Limit 42 Years in AP Govt Jobs - Upper age Limit 42 Years. “Not withstanding anything contained in the A.P. State & Subordinate Service Rules, 1996 or in the Special Rules or in the Adhoc Rules for any State service or Subordinate service and in supersession of the orders issued in G.O.Ms. No. 295, G.A. (Ser.A) Dept., dated:23-9-2014 and G.O.Ms. No. 381, G.A. (Ser.A) Dept., dated:17-10-2016 the maximum age limit prescribed in the said rules for appointment by direct recruitment shall be raised from 34 to 42 years for the purpose of direct recruitment to the various categories of posts to be notified from the date of issuance of this G.O. and up to 30.09.2017 by all the recruiting agencies in the State of Andhra Pradesh. The age concession over and above the upper age limit shall also be allowed to the categories as provided under Rule 12 of the A.P. State and Subordinate Service Rules, 1996. Provided that nothing in this rule shall apply for direct recruitment to the posts of uniformed services of Police, Excise, Fire, Prisons, Forest Department and Transport Departments for which physical standards have been prescribed in the State and Subordinate Service Rules or in the relevant special or adhoc rules”. 2. Government have now decided to extend the above adhoc rule for further period of one year i.e., upto 30.09.2019. In the said Adhoc Rule, for the expression “up to 30.09.2018.” the expression “up to 30.09.2019” shall be substituted. Direct Recruitment Max Age Limit 42 Years in AP Govt Jobs - Upper age Limit 42 Years. 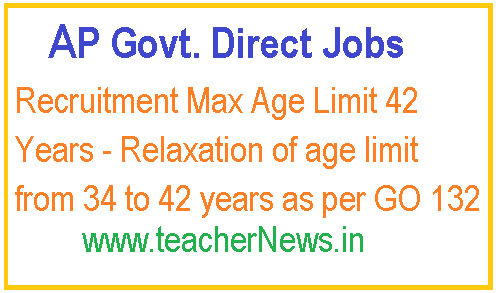 AP Govt Direct Recruitment Max Age Limit 42 Years - Relaxation of age limit from 34 to 42 years.